Sunny day, stunning beach, new friends and Jesus wearing a wig?? I don’t want to be disrespectful, but all these happened in just one day in Portugal coast! By this time I thought there was nothing else to talk about Lisbon and our great time there, but last night just came back some memories of a fun day and funnier evening. Again: Thanks Hugo and Ariana for giving us such an amazing time around the Portuguese capital. It was middle of May and everybody was super excited about the summer. The thermometer was showing 28ºC and the sun was shining bright. What is the best thing to do on a Sunday? Oh yeah baby, let’s go to the beach!!! After eating a real pastel de Belém for breakfast (Rob woke up early and ran to Belém to get some fresh ones for us), we jumped inside the car and Hugo drove almost 2 hours to our destination: Portinho de Arrábida. The beach is inside a natural park and the way there is beautiful. As it is located in a protected area there aren’t much restaurants and parking space. I suggest to go early and bring some water and fruits with you. Once you arrive there, for sure you won’t want to leave soon. Definitely we are sun seekers, and after a cold week in Madrid I was dreaming with white sand and blue sea. 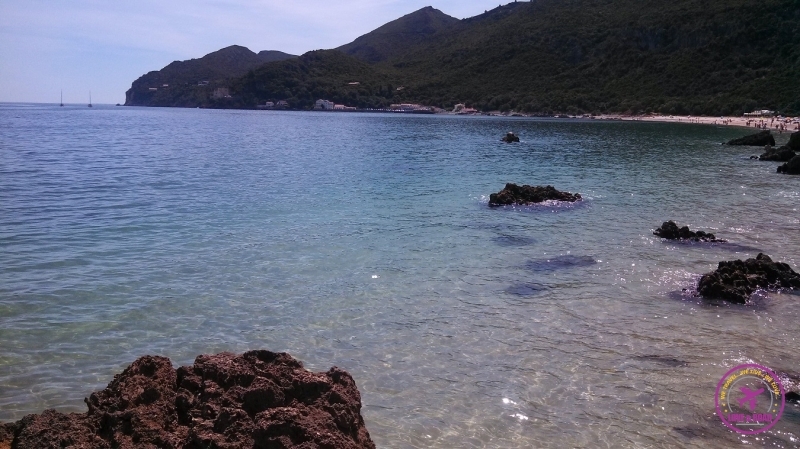 The sun was hot, the friends were great fun and the sea… hummm… the sea was freezing! No way to swim. Rob and Hugo tried, but as soon as the water touched their special parts Rob gave up! By the end of the day it was time to leave and find something to eat. Going back straight to Lisbon wasn’t in Hugo´s plan. After the beach he took us to a small fishing village. Sesimbra has a beautiful beach and an old town, great place to visit for a day and relax. We arrived in Sesimbra around 6pm and got surprised by a church procession. We were trying to walk to the promenade but all the streets were closed because of the parade. Suddenly came a huge image of Jesus on the Cross, and for my surprise he was wearing a long bright brown curly wig. I do believe in Christ and I don’t want to be disrespectful, but that was too much. We couldn’t stop laughing. Worst than that was we trying to pass by the endless procession. We waited for almost 20 minutes and it was still on. More and more people coming, so we counted to three, made a poker face and crossed the parade. Some old ladies kind complained… OMG!! What can I say?? We were wrong, the wig was wrong, and Ariana was starving (she was pregnant and we needed to find a restaurant!). I just hope God can forgive us! There are lots of restaurants in front of the beach, you can choose by the price or the view. We stopped by one and ordered fresh fish, of course! After a good meal and a stunning sunset (with a horrible and noisy firework from the procession) was time to go home. But before hitting the road we stopped by the fun fair. The city was decorated with flowers,flags and great street food. It was there that Hugo and Ariana introduced us to the sweet, greasy and delicious “fartura”. What is it? It is a dough in a long spiral shape, deep-fried and then covered in sugar and cinnamon. Still hot it is cut in small pieces and served to sugar addicted people like me! With all that sweet I was ready to go back home. We drove 40km to get to Lisbon, not bad as I was sleeping in the car, of course! I think I didn’t mention on the blog yet, but I am a great sleeper. Bus, trains, cars and planes, I can sleep in all of them, specially after a great day!